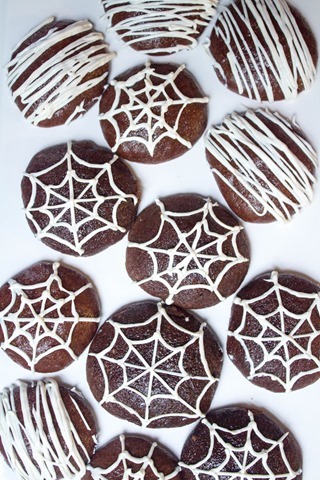 Thank you to Pure Canadian Maple Syrup for sponsoring this post and the delicious Halloween Spiderweb Cookies within it! I hope you guys love Halloween as much as I do, because I have a fun treat for you today! Looking for something cute to make for Halloween that’s fun and festive but not a complete sugar bomb? Look no farther. 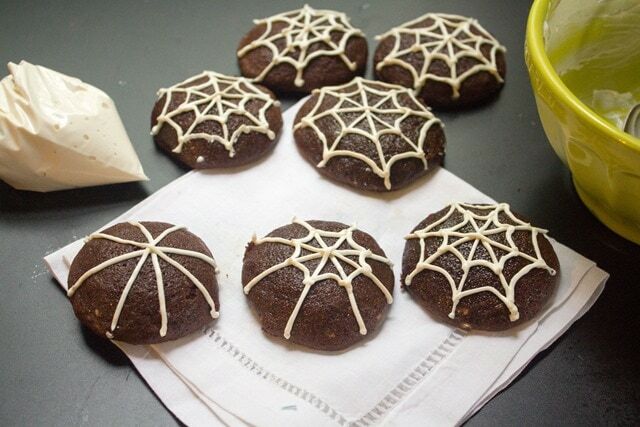 These spiderweb maple brownie cookies are fluffy, soft, chocolate-y, and all around delicious. Plus, they are really cute! You’d never guess that they’re whole wheat, sweetened only with 100% real maple syrup, and have just 3 tablespoons ​of butter in the whole recipe. 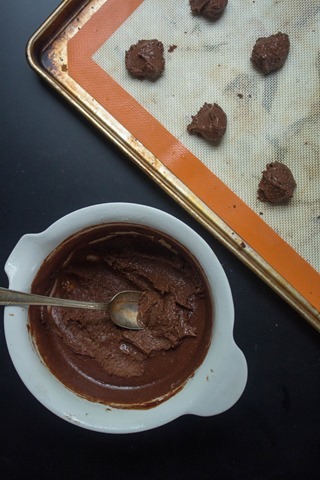 These cookies come together quickly – just plan ahead long enough to put the batter in the freezer for an hour, or until you can scoop it with a spoon. The cream cheese frosting couldn’t get any easier and would make a great filling if you wanted to sandwich two cookies together to make whoopie pies! You could also easily modify these cookies for Christmas by drawing little snowmen on top instead of spider webs. 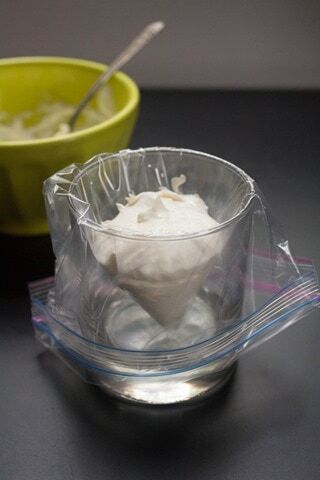 The easiest way to work with the frosting is to put the corner of a ziploc bag into a cup and fold the bag over the edges of the cup, then spoon the frosting into the corner of the bag. I learned this cup tip on a blog trip this summer that included a cooking demo (although they were using a fancy pastry bag – a ziploc works fine). Then you just squeeze out the extra air, seal the bag, and twist to make a little pastry bag. 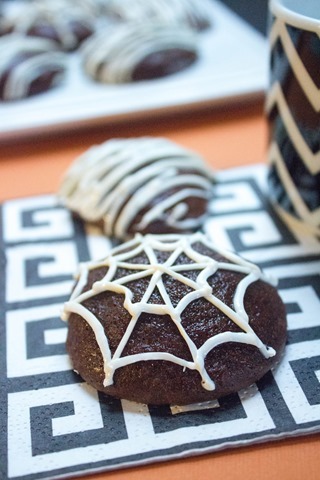 To use, cut off the tiniest amount possible of the bag’s corner (you can always snip again to make the hole bigger) and squeeze out the frosting onto the cookies. If you want to take it easy on decorating (or if really little kids are helping out), a “mummy” pattern is even easier! 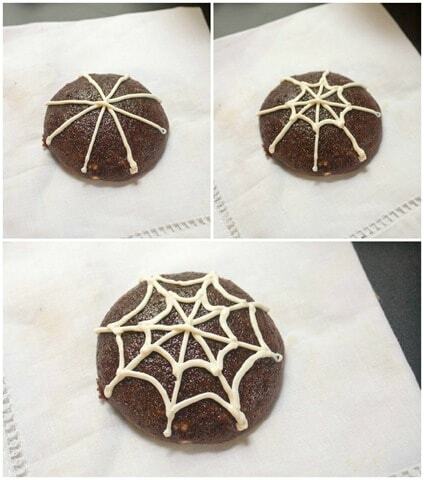 Just squeeze the frosting back and forth quickly across the cookies. You can lay them out next to each other and drizzle several at a time, too. These spiderweb cookies are a fun and delicious Halloween treat. You'd never know they are whole wheat and sweetened only with pure maple syrup! 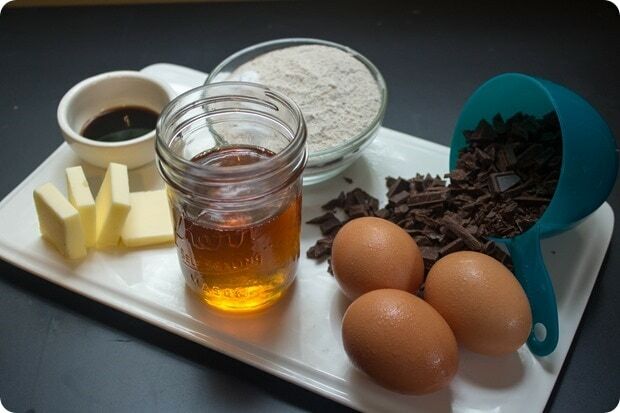 In a microwaveable bowl, combine chocolate and butter. Microwave in 15 second intervals until the chocolate melts completely when stirred (it should take about 45 seconds). Stir in the maple syrup and vanilla. Transfer mixture to a larger bowl if necessary and whisk in the eggs until smooth. Add the whole wheat pastry flour, salt, and baking powder; whisk to incorporate. You should have a thick, pourable batter, almost like pancake batter. 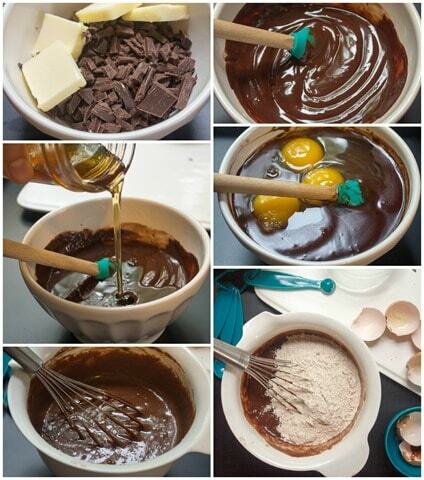 Freeze the batter for at least 1 hour, until you can scoop it with a spoon. Scoop the dough out by tablespoonfuls onto a parchment paper or silicon mat lined baking sheet. Bake for 6-8 minutes, until just set. Stir the softened cream cheese and maple syrup together in a bowl. If the cream cheese is still too hard, microwave the mixture in 10 second increments until it blends together easily. Put the corner of a ziploc bag into a cup and fold the bag over the edges of the cup, then spoon the frosting into the corner of the bag. Squeeze out the extra air, seal the bag, and twist to make a little pastry bag. To use, cut off the tiniest amount possible of the bag's corner (you can always snip again to make the hole bigger) and squeeze out the frosting! Previous article: This Week’s Food/Fitness + The Return of Packed Lunches! These are adorable!! 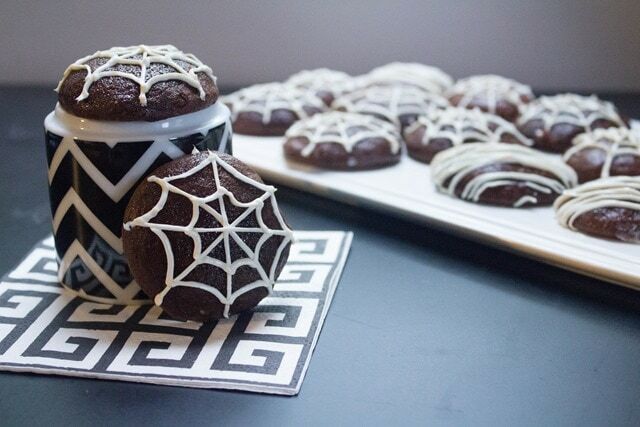 I wish I were throwing a party- these would be a hit! So when should I come over? :) Good luck this weekend!!!!! How pretty! These are so cute. What a presentation! Enjoy your Friday! These cookies are too cute and perfect for a handful of holidays too. It’s been too long since I’ve baked a batch of cookies at home. Saving this recipe! 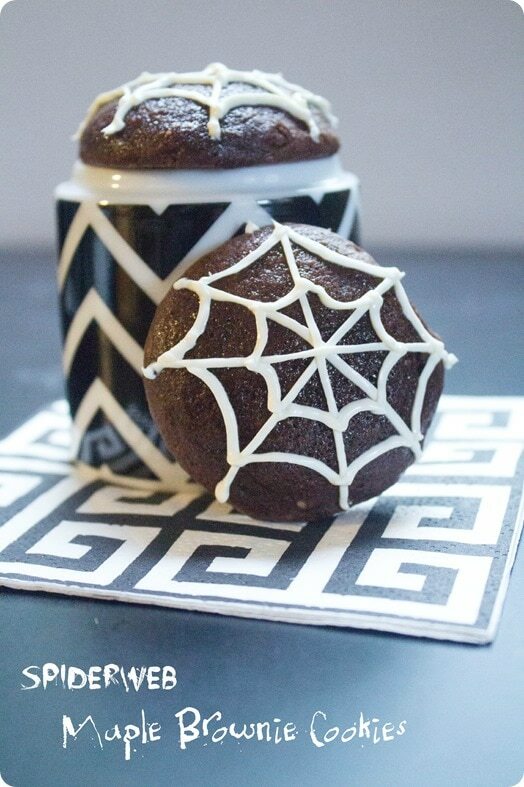 These look super cute and easy to make. I love that they are a lightened up version, definitely going on my to-make list for next week! So cute and easy! Thanks for sharing! It’s so hard to find treats that aren’t full of sugar so this is a nice alternative. This recipe is perfect! Limited ingredients with an incredible result. These look so chewy and rich, I love it. Cute cookies; love the design on top! And I feel like you could send these with a kid to school for a Halloween party feeling better that they have a more nutritious option free of preservatives and dyes without them ever knowing the difference. Beautiful pics BTW. Love how you set out the ingredients. 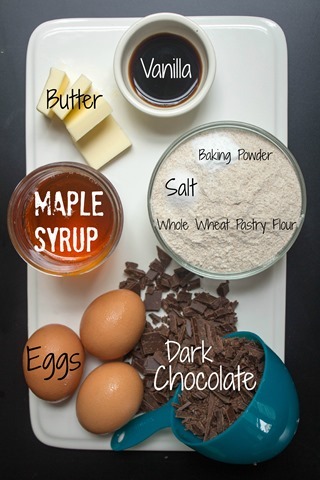 The recipe layout and pictures look great with this posting. Love the improvement. I don’t know if you had been working on changes, but I think it looks wonderful and flows very well! Those look fairly easy to make and so cute! It’s rare to find a treat with whole wheat flour and maple syrup that actually tastes good. Wow, what did you do differently with the pictures in this post? Did you get a new camera? It looks nothing like your typical posts! Do you think that these would freeze well? If so, for how long? Thanks! I’m not sure. .. probably if wrapped well to prevent freezer burn! These are gorgeous!! I’m not very good at making but these dont seem too difficult… also I LOVE using maple syrup in place of sugar, great recipe! How about for those of us who must be gluten-free. Could we substitute almond flour, garbanzo flour, coconut flour, amaranth flour, or some combination? Bob’s Red Mill gluten-free mix doesn’t work for us because of some of the ingredients. Suggestions? Love your photos and always artistic, thoughtful presentations. I wish I could help but it’s usually a bit complicated to simply swap flours because they absorb liquid differently, etc… I’m sorry! You could try garbanzo flour and see if it worked? How long will these stay fresh? We are having a halloween party saturday so I am wondering if I should I make them the day of or can I throw them together tomorrow?